A friend who blogs over at “Watchman’s Bagpipes” sent me a video. Part of his ministry includes sending out books or DVDs to others who are interested in them. He does this for free to those only in the United States. Almost as soon as I received the video, I played it one evening when my wife and I had time to watch it. The video was produced in 2005 and runs 66 minutes, with 40 minutes of deleted scenes and added interviews. It is in English, Spanish, and Portuguese and include English subtitles. The video is produced by Living Hope Ministries and for those who do not have access to the DVD, it can viewed at their link at YouTube. The video is very informative and easy to follow and it’s not simply because I happen to agree with it. Some of the information brought out in the video (often by ex-Mormons), is that there is virtually no evidence that supports the cities or other historical alleged facts within the Book of Mormon. This is actually huge because the video also includes information regarding the many proofs found within history that connect to biblical archaeology. One would think that if the Book of Mormon is true, there would be actual historical evidence in the form of previously written works and/or archaeological evidence supporting the information within the Book of Mormon. In essence though, there is NONE. What this means is that die hard Mormons who continue to accept the Book of Mormon do so either because they’ve simply grown up believing it to be true or they prefer not to look at anything that dismisses the Book of Mormon as being untrue. One of the things that the video also includes is the many historical and archaeological proofs that support many aspects of the Bible. In fact, there exists MANY partial and a few full manuscripts of biblical books. Beyond this, there have been many, many archaeological digs that have uprooted artifacts that support the biblical narrative. This is not the case for the Book of Mormon. In fact, basically the only thing that tends to shed light on the Book of Mormon are the golden tablets, yet they are not available to be viewed or examined to the public. Granted, within Judeo-Christianity, we do not have the original ten commandments either. We know that Moses destroyed the first set in his righteous anger and God created a second set. This also has been lost to history as has many other things within the biblical record. However, not having these things does not mean they did not at one time exist because there is much evidence to support the fact that they did at one time exist. A great resource on things of the Old Testament is found in a book called The Genesis Record. It is replete with information that tends to shed light on many of the scenes found within Old Testament Scripture. The Book of Mormon claims to be a ‘volume of holy scripture comparable to the Bible.’ Both the Bible and the Book of Mormon declare themselves to be ancient, historical, and reliable rules of faith – the very word of God. If the above is true, then surely, like the Bible, we would find supporting evidence – either historically, archaeologically, or even via textual criticism – for the claims within the Book of Mormon. Unfortunately, this is never the case and as disclosed on the video, leaders and officials from the Church of Mormon essentially admonish Mormons to simply accept “by faith” the claims of the Book of Mormon. The problem is that God does not expect us to exercise “blind” faith when it comes to Him or His truth found within His Word, the Bible. God has graciously stooped to our level and offered proofs of His existence as well as many proofs throughout His Word. This is often why “higher critics” often deny the authorship of a particular book. Daniel is a case in point. Many of these so-called higher critics argue that the Daniel that wrote the book of Daniel was an imposter, coming after the facts of history and was merely able to look back through the previous ages and write a book that appeared to be forward-looking (prophetic) as a means of providing hope to Israel. Why do they take this approach? Simply because the history within Daniel (much of it future history from Daniel’s perspective), is so detailed and correct that it cannot be denied as having occurred (or will occur), so the only real choice left for these critics is to say that the book of Daniel was written by another Daniel who came much later than the Daniel referred to in that book. Critically thinking people understand that this type of thinking doesn’t wash. It is the same with the Book of Mormon. Many Mormons simply grow up within that system and simply accept as true what they’ve been taught all their lives. They do not question it because they want to remain in good standing within Mormonism. Beyond this, many don’t think to question it because they have been “brainwashed” to simply accept what is taught. Again, the belief that Mormons are to simply accept through blind faith everything that is stated in the Book of Mormon is what is emphasized in the face of basically nothing that supports the claims of the Book of Mormon. Something is seriously wrong here. Why would God have spent so much time providing hard evidence throughout history that the claims of the Bible are true, yet where the Book of Mormon is concerned – which also purports to be holy Scripture that is comparable to the Bible – there’s essentially nothing by way of historical, archaeological, or textual proofs of what is contained within the Book of Mormon? Dear Reader, if you happen to be Mormon, please don’t take this particular article as an attack on your or your faith. Take it as simply questions that deserve responses. Don’t take the time to debate me. Instead take the time to do your own research. Know what you believe and WHY you believe it. If there has never been found anything that would corroborate any portion of the Book of Mormon, why would you continue to believe in its alleged efficacy? Remember too, many of the individuals who produced this DVD were once Mormons. They came to conclude that if there is nothing that supports the alleged historical facts of Mormonism, including the narrative of early people in America, then maybe the entire religion of Mormonism should be questioned. It may also be worth while to do some actual research on Joseph Smith, who originally hailed from New York state. He has an interesting and possibly questionable history. 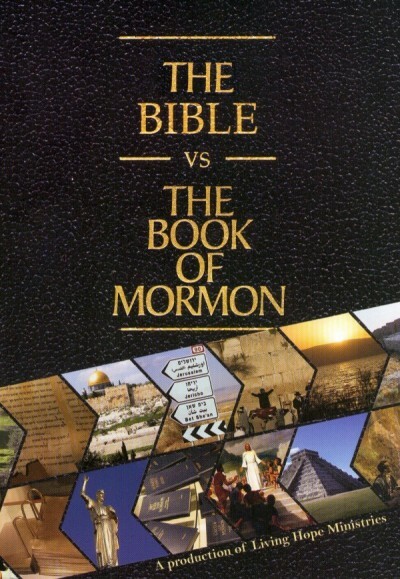 The DVD The Bible vs The Book of Mormon is an interesting documentary. It poses some very good questions that deserve responses. Is Mormonism true or is it to be accepted on “blind faith” regardless of the proof or lack of it? I hope you’ll give this DVD some time and attention. I’ll be passing it along to a friend of mine who spent years as a Mormon. While he no longer considers himself a practicing Mormon, he still does not believe Mormonism may well be serious error. Would you pray for him as I pass the DVD along to him? His salvation hangs in the balance. Entry filed under: Atheism and religion, christianity, Demonic, devil worship, eternity, Life in America, new age movement, Political Correctness, Politically Correct, Politics, Religious - Christian - Prophecy, salvation, Satanism. Tags: joseph smith, mormonism, the bible vs the book of mormon. Thankful Update and More! Voter Fraud Affecting Elections? The Book of Mormons is based on golden tablets presented to founder John Smith by an angel called Moroni. It micmics God’s 10 Commandments given to Moses, thus is a satanic corruption of God’s words in the Bible. In Gal 1; 6-9 the Apostle Paul anticipated and condemned such extrabiblical revelations or “another gospel” that contradict his divinely inspired teachings even if taught “by an angel from heaven”. Thankfully the curse applies to the teachers rather than to the gullible misled hearers of the false teachings of numerous religions and denominations throughout the ages. I agree and it is tragic that this aberration has gained such a following. I expose the fraud of the whole LDS cult from the beginning to current times.